This was going to be about why you shouldn’t chug two bottles of hard liquor – and it still is, really. A matter of weeks ago, colonists in Clockwork Empires could (and would) drink to great excess when they were the least bit upset. Which is almost okay in a semi-grimdark Historically Accurate Frontier sense of things, but the point at which a colonist knocks back multiple bottles of whisky is going too far, for lots of reasons, not the least of which is that we’d expect a normal human to have horrible alcohol poisoning after such a stunt. Plus the economic balance is uninspiring, considering the opportunity cost of making booze vs. bread (related, tangentially, to a re-balancing adjustment that doubled hunger growth). Sure could use a drink. 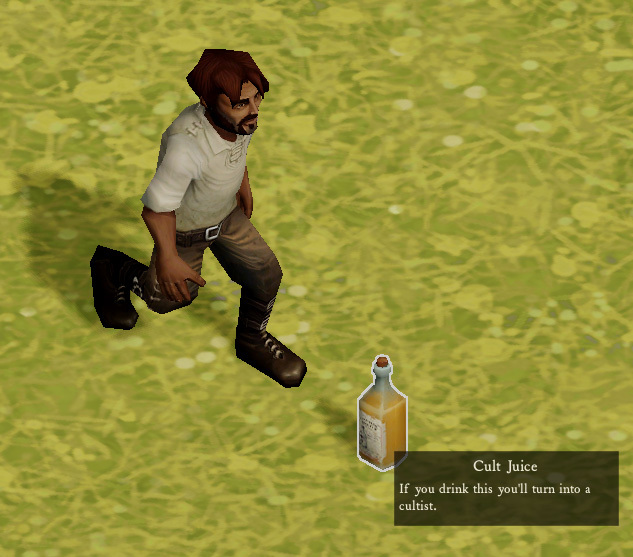 So what’s booze to do in Clockwork Empires and how can it help my colony when it’s turning into a big mess? And how do cults work into it? brewed: basic-level ‘beer’ made in a simple brewing vat. A colonist might have a pint of this at the pub in the grand British Tradition; should act as a minor domestic staple which isn’t necessary for survival but makes colonists a little happier about their life in the Colonies. medicinals: distilled alcohol mixed with other things included highly inadvisable drugs and other chemicals, made using distilled booze plus other ingredients by a chemist. This categories includes both laudanum and sulphur tonic at this point. Medicinals are a chance to cure “madness” at potential physiological cost including not only losing work-time due to tiredness, but possible injury and even opium addiction. So what’s this “madness” and what’s the problem with it? We don’t want to make this a warped reflection of Victorian (lack of) understanding about mental illness, though I imagine genre trappings infiltrate our themes slightly, but more of a Cosmic Horror measure of supernatural exposure intrinsically damaging to the human psyche. Mundane but extremely horrifying things may count as well (cannibalism, having to employ Frontier Justice on friends). Before last month, cults kinda just happened if you allowed colonists to talk to each other the dice rolled in a particular way, and certain traits and moods would load the dice a bit. Enough talk about certain subjects (murder, cults) would pump up an abstract value that would trigger extreme occult behaviours. This system effectively punished you for allowing colonists to socialize by triggering shrine construction and murder willy-nilly. This was hilarious the first few times but ultimately frustrating. In overhauling the system, cult activity is now the result of failures (of a sort) that have pushed your colonists outside of safe & normal expected human experience. Booze – and the general well-being of having a nice, safe, and functioning colony which includes allowing people to socialize with one another allows colonists to be pushed back into safe & normal expected human experience by spending resources. Instead of inevitable cultist entropy, there are now tools to allow the player to pull back from the brink of cultism. And now that you have these tools, we can both re-introduce the more destructive occult behaviour AND tie it into other game systems that we’ve been working on. For example: Shrines are now associated with a particular cult which will be very upset if it is destroyed. You may, via event (related to the framework for character events discussed in a previous blog post) set your colony’s policy toward cult activities. Do you permit them to practice their strange rituals? Do you violently persecute them? Or maybe you take a low-conflict approach and … here’s where we tie it all into a neat package … flood the colony with high-proof alcohol and laudanum to reduce anger and madness levels to the point where the cultists simply aren’t Mad enough to do anything cultish? For testing purposes, I made something that does the exact opposite of Laudanum. This requires the player to spend some resources in the form of a working Brewery – Chemist production chain, plus farming Opium or mining Sulphur, but it gets the job done without calling Frontier Justice on anyone. Like in real life, solving problems with violence should indeed be chaotic, upsetting to those involved, and problematic course of action (which in CE terms may well cause Madness to spiral further out of control). Now making this all work involves somehow making characters, cults, world objects, jobs, and events all play nicely with each other. The framework works! The ability is there! Now we’re diving into the tangles of logic and connect all the pipes in meaningful ways (and ensuring they let the player know what’s going on well enough that any of it matters, at that). The best part is, you’re all going to be able to play with these systems in the next experimental build release. … So you know who else likes booze? Bandits. But that story is for another post. 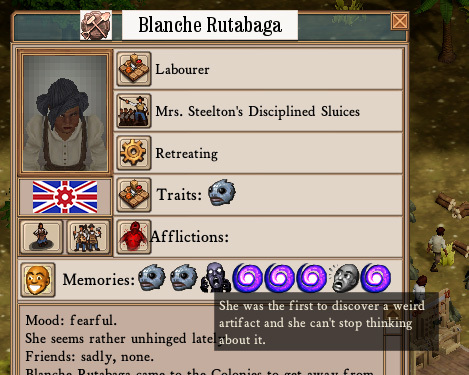 Posted in Clockwork Empires	| Tagged > [blanche rutabaga], Cult Juice, Doctor Sanin's medicinal Sulphur Tonic is not recommended by the for internal or external use, have you tried turning the cult on and off again, historical accuracy, in clockwork empires opium is actually the opiate of the masses, inter cult drama is lovingly based on the real life problems with the Unarian Space Brotherhood in the 1970s, not in the game yet is the manufacture of those sweet purple robes and hoods from our halloween trailer, oh so we're just using the word grimdark now in polite conversation - how far we have sunk and how far we have yet to fall, phenomenal cosmic horror and itty bitty living space, poor life decisions, winners don't drink laudanum, you can grow opium in Harvest Moon? You know, the “This isn’t at all how you are supposed to store commodities” screenshot included in the email update looks awesome. Things floating just a bit, spinning about in odd ways — definitely has an “eldritch event” vibe. What happens when the guy whose job it is to destroy a cult shrine is, in fact, the leader of the cult that built it? Have you read A Scanner Darkly? Started to, but things turned bad before I could finish it. – on behalf of Nikola Tesla, who was living in a higher place. At various times they also purchased land to welcome the arrival of the Space Brotherhood, and various other exciting activities. My local bookstore has “Tesla Speaks through the Voice of Unarius” (or something like that), volumes 1 through 17. It’s quite something. Could there be cults whose rituals involved consuming medicinals? This seems like a thing that would be a thing, but it doesn’t really fit with the system you describe. Of course, eventually there’s sanitariums, which take in medicinals and cultists and let out sane, sober individuals (mostly), but at high cost and investment. Unless the heads of the place are cultists, in which case it takes in medicinals and cultists of other cults and lets out super-crazy cultists of one specific cult. Hm. That makes me think of something nearly as cool but easier to implement: Cultist doctors giving pro-madness tonics. I don’t know why, but I’ve loved the term “administered Justice” ever since I read it on the Dwarf Fortress Wiki. Justice, recommended by 1/1 executions, guaranteed to cure all crimes! It would be interesting to have minor punishments incorporated into the justice system such as building a pillory or a flogging post. When a colonist is selected for frontier justice, the system could select the punishment instead of jumping straight to execution. Not only would this be a deterrent for unacceptable behaviors (such as gossiping and idleness), but it can also be entertainment for the masses. It would also be interesting to add ceramic and glass jars as part of the cost of making beer, whiskey, and medicals. Jars could “break” after a random number of uses, and new ones could be made in the ceramics shop. It would also be a nice touch to have colonists find a table to sit and drink their brew instead of chugging it right when they pick it up from the stockpile. We did, in fact, make assets for these and in the first implementation of brewing they were required. The problem is,it made brewing effectively quite extraordinarily expensive for what it does. We’ll have to see how things work out as we get skills, machines, and stacking happening. Hello Gaslamp guys, I would appreciate a cemetery prettier, with fences on the perimeter and a sign of entry with wild west type cemetery, hi thanks.